The Invisible Hand is the fourth studio album within what can be described as a very forward-thinking "acoustic period." What force is pulling you into this direction? Personally speaking, I don't normally differentiate between musical environments nor would I consider my current work a "direction" as the compositions stem from a conceptual base rather than from one of circumstances. The primary challenge for me is to approach each situation with preparedness, openness and fearlessness - and not to make the situation appear more important than the art itself. I do attempt to compose music that will make its point and sound complete regardless of the instrumentation. I also think that music as art should transcend the limitations of expectations based on stylistic impositions. Generally, I compose from within a framework of processes that are exercised throughout the whole project. I am usually faced with how will I combine these means in a format that will be pleasant and acceptable to the uninitiated listener. Simply speaking, I am attempting to make these concepts sound pleasant and feel good. This can be quite a task as it is exceedingly difficult to both satisfy my own experimental nature and please others as well. Why was it important for you to work with Jim Hall and Andrew Hill? I think it's extremely important for an artist to seek out progressive individuals that inspire, motivate, and direct them towards a higher creative plane. I have been fortunate in having had the opportunity to participate in many creative music ensembles and to establish deep personal relationships with great persons who have influenced me positively. Andrew Hill and Jim Hall are two incredible sources of a type of knowledge that is nearly impossible to acquire these days. These distinguished gentlemen have truly lived the life that is clearly expressed in their art and It would be criminal of me not to avail myself of their information and experience, given that they are willing to share it. I've been working with Andrew on and off for 12 years now and Jim about 4 so I know their music and directions quite well. Bringing them together specifically for this project was a once in a lifetime opportunity. What was your musical highlight from the recording session? I intentionally created this situation so that I could to witness, from a first hand perspective, how these respected veterans that represented two completely dissimilar conceptual approaches would respond to one another, musically speaking, in a neutral situation. The process, from rehearsal through the actual recording, allowed me an insight to actual adjustments being made on behalf of each participant. I was also eager to see how these great artists, who hadn't done any sideman work since the sixties, would take direction from someone in my humble position. It was a truly unique and rare opportunity to learn from two of our music's finest contributors. Initially, Andrew was a bit tentative while Jim appeared much more curious. Andrew was quite concerned that his advanced voicings would not match with Jim's unique chordal choices and he compensated accordingly - at first. Slowly he began to pepper the music with his trademark stylings and I was privately elated. As I knew in advance that Jim does not prefer to play with pianists in a group setting, I marveled as he searched for the spaces to add embellishments and supplemental harmony. This is not easily accomplished when in performance with Andrew Hill but Jim, quite the knowledgeable master himself, rose entirely to the occasion. The pieces realized themselves progressively with each successive run and before long Andrew and Jim both performed as if they had been playing together for years - even though I had only introduced them to one another earlier that day. I'm actually quite proud of that fact. My only regret is that I didn't film the rehearsals. Rhythm (Section) Changes - you've flowed from R&B, Hip-Hop, M-Base to more acoustic ensembles, how have these changes to your rhythm sections shaped your musical vision? My group theory is based on a set of measures and structures that I call Shifting Melodic Order. I have utilized this method for nearly 16 years and I consider it the thread, the common element that remains constant in all of my work - composed or improvised. I felt that in order to express myself honestly it would be necessary for me to formulate a series of motives that would serve as reference points for improvising. This developed into a full blown composition logic. This issue is of utmost importance to me as a practicing and perpetually developing artist. Personally speaking, I feel that the scene would benefit greatly if more artists recognized the importance of personalized, structured and logical approaches in music - that maintained a groove, pulse or swing. Interestingly enough these days, by composing music that is well formulated and not patronizing, one is accused of being "left of center, or on the cutting edge", or worse. This is amazing given that the great icons of American music all had personalized concepts that gave their work an identity of it's own. This music was borne of deep creative thinking and experimentation - not merely the results of accidents or simple intuition. It takes a creative mind, sacrifice and will and I wish that these issues were concerns of more people in my peer group - as opposed to being famous and popular. You have been playing the Alto-Saxophone for 28 years. Do you ever feel there is another "musical" or "instrumental" voice inside of you? I consider soprano saxophone a completely different instrument although I have partially retired from performing with it in live situations. I have never been satisfied with how it comes across outside of the recording studio. Also, many drummers are not sensitive enough to the sensitive acoustic or amplification needs of the instrument and force one to overblow the soprano - thus producing a whiny, nasal tone that is anything but beautiful. It's difficult to be articulate in an excessively loud situation. I actually played clarinet on "The Invisible Hand". Even though it is my first instrument, I only consider myself merely competent on it at best. I sold my flute in the mid-eighties because I thought it necessary to narrow down my instrument arsenal to a couple that could be developed in a realistic fashion. I know lots of cats that have a closet full of instruments and play them all very well but have never made the effort to develop an identifiable voice on any one. This is not a criticism. I was simply motivated to do otherwise. You have a history of reaching out to your fans - through your website, touring with New Directions and your decision to put out a specially priced live CD, Banned In New York. Why is this connection with your fans so important to you? In the past, I have made the mistake of cramming far too much information into my recorded work - thus, I have confused many listeners. With the website, I can control and monitor it's full content and further explain what I am attempting to do without cramming all of my intentions into each project. New Directions was a idea to present some of the younger artists on the label to the public in a cooperative group situation and it was extremely successful. I always thought that the music has an inherent appeal to young people especially if they identify more with the practitioners. In other words, when people look on the stage and see musicians that they can relate to directly, there's a chance that they may assume the music might be a cool thing to get into as well. They should be allowed to make decisions without being preached to as many musicians often do. This was proven on the New Directions tour last year when our audiences were overwhelmingly comprised of enthusiastic young people that came out in mobs - voluntarily. The "Banned In New York" CD was my idea of what a "live" performance experience truly sounds and feels like in person. No announcement, no advertisement, no frills. Just a documentation of the set as it happened. 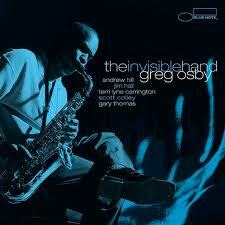 The Invisible Hand exemplifies the importance of uniting several generations of jazz musicians. How can "Jazz" benefit from these "meetings of musical minds"? I arrived in New York in 1983 and during that period there were a great many places where a new arrival to the city could go and play on a nightly basis to hone their craft and hear other musicians with more experience express themselves as well. There were also many active groups on the scene hosted by important and established elders with years of experience and wisdom who would graciously allow one to sit in so that they could "check you out". If they were impressed by a budding talent or the unrefined potential of a young player, it was likely that a situation to tour and/or record would present itself. It was through these relationships that the elders could impart their worldliness, philosophies and musical applications to a youngster in need of artistic guidance. It was an incredible exchange - the elders would cultivate the talents of the next generation and the youngsters would enjoy the benefits of on the job training in a professional situation. The contemporary music scene is abundant with players that are presented to the public without having had the luxury of that type of institution. I wouldn't go so far as to state that the music suffers as a result, but there is a great deal to be said for getting information firsthand from a living source as opposed to acquiring it from some reference material that may have been distorted and embellished beyond recognition. I would firmly suggest that every musician take it upon themselves to do the necessary research and ask as many questions as possible to the many great, living contributors to this great music. The lessons learned will be priceless.